Ever wondered how the Lagrangian points work? Or how the asteroid belt came (and stayed)? I found a great explanation with an even greater image and I hope you enjoy this as much as I do. Jupiter and the Sun are the two largest objects in our Solar System. Jupiter orbiting around the Sun, but being as big as it is, also pulling at our star. In this dance of orbits, they create regions where their gravity roughly cancels out. These are the Lagrangian points, created whenever two objects orbit one another. In such Lagrangian Points the gravity is such that another small object can follow along in the orbit without being pulled in or out. As things aren’t getting pulled out of there, they get stuck in there as well, which created two large clumps of asteroids (and miscellaneous smaller space debris) in Jupiter’s orbit. [brThese are called the Trojan Asteroids. The group ahead of Jupiter is known as the Greek Camp, and the group behind it the Trojan Camp, with the asteroids in each camp being named after famous people in that ancient war. (If you want to read up on that war of 3,000 years ago I recommend this free translation of Homer’s Iliad or if you are pressed for time you can use the movie Troy with Brad Pitt as Achilles) [br] Together, these two camps have as many asteroids as the Asteroid Belt. None of these orbits are perfectly stable, because each of these asteroids is subject to pulling from everything in the Solar System; as a result, an asteroid can shift from the Lagrange points to the Hilda family, and from the Hilda family to the Asteroid Belt (not shown in this image), especially if it runs into something and changes its course. Ceres orbits in the Asteroid Belt, about halfway between Mars and Jupiter, just inside the triangle of the Hilda Family of asteroids; Pluto and Haumea are both in the distant Kuiper Belt, outside the orbit of Neptune but shepherded by its orbit in much the same way that the Hildas are shepherded by Jupiter; Makemake is what’s called a “cubewano,” living in the Kuiper Belt of asteroids but unshepherded, orbiting independently; and Eris is part of the Scattered Disc, the even more distant objects whose orbits don’t sit nicely in the plane of the Solar System at all, having been kicked out of that plane by (we believe) scattering off large bodies like Jupiter. But mostly, I wanted to share this to show you how things work in orbit around Jupiter, and in our nick of the Solar System. 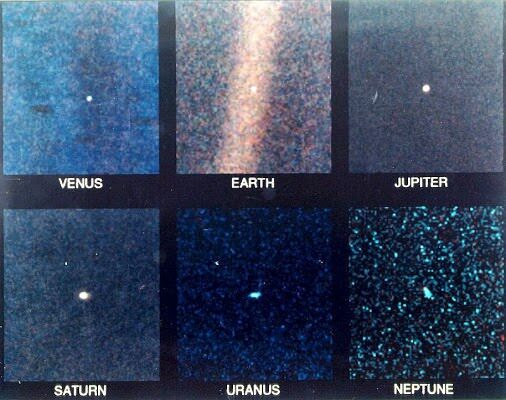 Image by Voyager 1, NASA, when it was 4 billion miles from Earth. The moving picture of the Trojan asteroids comes from the amazing archive at astronomy groups on the internet, which has many other such pictures, and comes to me via Google+ : [br]+Yonatan Zunger via +Max Rubenacker. Is there Life on Mars right now?